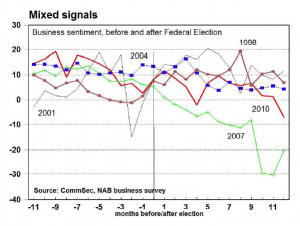 In the lead up to the 2013 poll, as well as the previous five Federal elections, gauges of consumer and business confidence generally tracked sideways. But apart from 2007, confidence levels generally lifted modestly following Federal election outcomes before other issues took greater prominence. 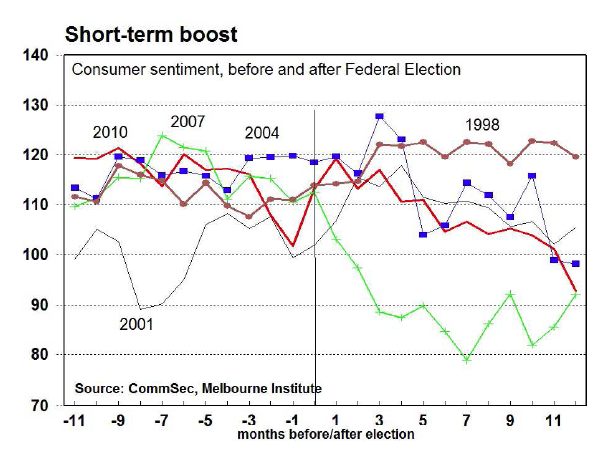 Generally the short-term election boost lasted just a couple of months. 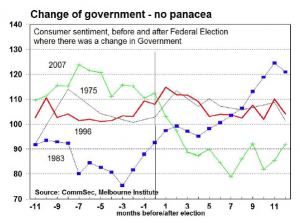 It was a similar story when we examined consumer confidence after there had been a change in government. The consumer sentiment index has been in existence since 1973 and since that time there have been five changes of government including the current time: 1975, 1983, 1996, 2007 and 2013. 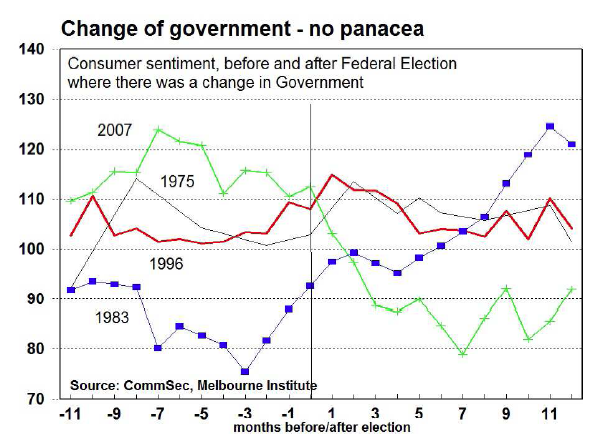 Again, apart from 2007, there is evidence suggesting that consumer confidence lifted on expectation and confirmation of a change in government. But the boost to confidence dissipated a few months after the poll. 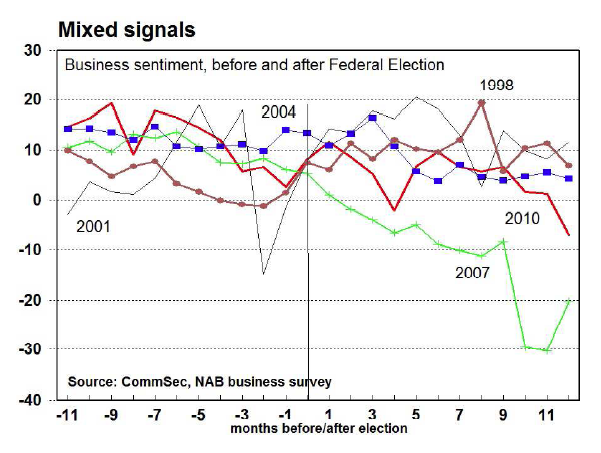 The monthly NAB business confidence index has only been in existence since 1997 so the only response to a change in government was the 2007 poll. Like consumer confidence, business confidence was easing into the 2007 poll and continued to fall after the election as the effects of the global financial crisis were manifest. For investors, there is no question that elections are times of uncertainty. 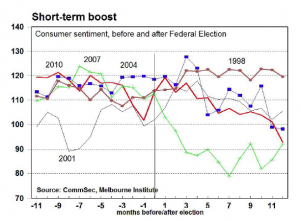 And while there is no clear evidence from past polls that Federal election results are unambiguously positive or negative for the sharemarket in the short-term, certainly in each of the last five Federal elections before the latest poll, the Australian sharemarket was stronger three weeks after the poll date. In the 2010 election (a hung result) the All Ordinaries eased by 2.1 per cent ahead in the three weeks ahead of the poll. And while it was largely unchanged in the eight days after the poll, after three weeks after the poll it was 3.1 per cent higher than on the Friday before election day. In the 2007 election (involving a change in government) the All Ordinaries eased by around 3.5 per cent over the three weeks before the poll but then it regained all lost ground after the election result. In fact the sharemarket exhibited a ‘U-shape’. Interestingly in the previous two elections involving a change in government (1983 and 1996), the sharemarket also basically ended up at the same point three weeks after the election as where it started three weeks before poll date. The 1972 and 1975 Federal elections also involved changes of government but the sharemarket on each occasion was stronger in the three weeks after the poll. In the case of the 1972 election, the sharemarket rose by 2.2 per cent and the market lifted 3.8 per cent in the three weeks after the 1975 poll. From the date the Federal election was called, up until last Friday, the All Ordinaries lifted by 0.9 per cent while the US Dow Jones lost 4.7 per cent. And over the past three weeks, the All Ordinaries lifted by 0.9 per cent while the US Dow Jones fell by 1.1 per cent. Since the Australian dollar was floated in December 1983, there have been 10 Federal elections. The Australian dollar has risen on seven occasions and fallen three times in the three weeks after each poll. But on average, the Aussie dollar has appreciated by 1.2 per cent against the US dollar in the three weeks after elections. It is important to note that the Australian dollar has appreciated against the greenback following each of the last six Federal Elections, including the 2007 and 1996 polls that involved changes of government. On average, at the last five elections the Australian dollar appreciated 2.7 per cent in the three weeks after the poll date. Prior to 1996, the last change of government occurred in March 1983 – that is, before the Australian dollar was floated. Interestingly in 1983, ahead of the March 5 poll, there was a significant outflow of capital, as investors grew nervous about the possibility of a change of government. The Reserve Bank estimated that the capital outflow amounted to 3 per cent of money stock or around 1.5 times Australia’s annual GDP. Following the election – on March 8 1983 – the Labor Government was forced to devalue the currency by 10 per cent in an attempt to stem the outflow of funds. In the period from the calling of the 2013 election up until poll day, the Aussie dollar rose by 3.1 per cent – from US89.09c to US91.80c. But over the three weeks up to poll day, the Aussie was largely unchanged – modestly softer than the performance of the sharemarket. Holy crap. The post-election firework predicted by some is an illusion after all. Ok, I will stick to value investing even though it is a bit boring.